From time to time it is nice to try out different ideas when planning a walk other than the regulation circular walk. One issue we find at times is trying to satisfy the wishes of all our membership; some people prefer shorter walks, others longer and some like to have a lie in on their Sunday morning! These boxes can all be ticked by planning a double loop hike whereby we return to the start point of the first loop meaning people have the option of bailing out if they wish and as I submitted the two loops as separate walks others could opt in. 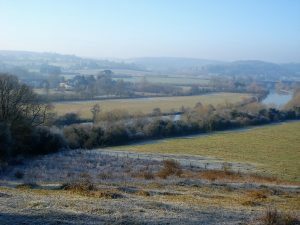 I like to encourage this idea and so offered the walks to our friends and neighbours the Oxon 20-30s Ramblers group to see if it may inspire people in that group as well as our group to replicate the idea. 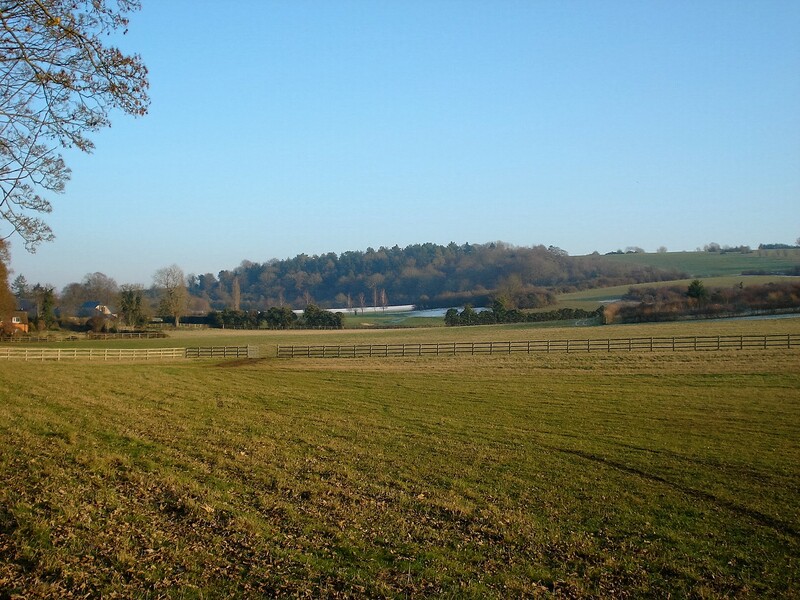 My choice of starting point was the popular location of Goring, situated right on the Oxfordshire Berkshire border. To be precise Goring is in Oxfordshire and the first loop would be in this county. The weather was pretty much as perfect as could be for a winters day; cold, fresh and very still with unbroken sunshine. 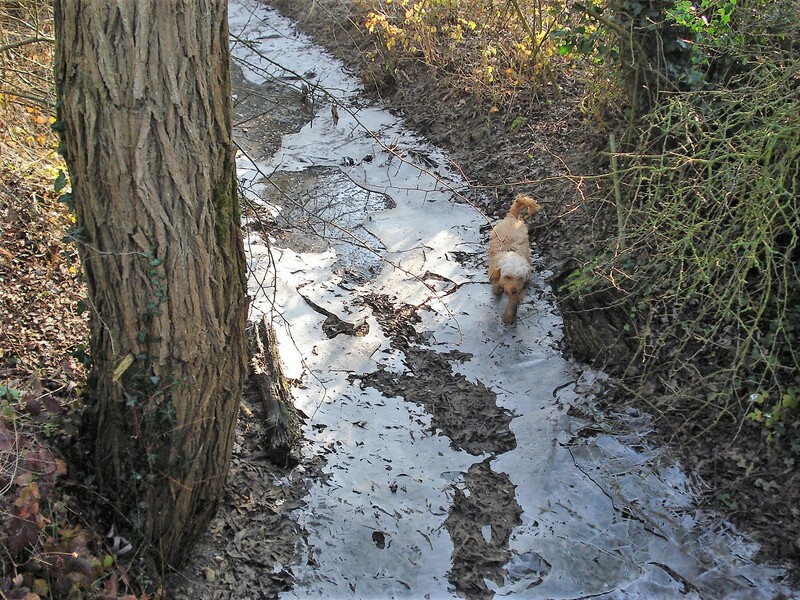 It remained cold enough for the mud to remain frozen over which was perfect early on as it would have otherwise been rather muddy. My route took us past the dwelling of a sadly recently departed celebrity, the floral tributes were plentiful and on to the Thames Path. For some in the Oxon group this bit of the walk would be familiar as their group have been tackling the whole Thames Path in its entirety, completing this stage fairly recently. Numbers in the walk were naturally very high due to the good weather and the fact we had two walking groups. If memory serves we were at around forty two for the morning loop. During this Thames path stretch I was prepared to let the group spread out with me leading, at times, from within the group rather than at the front. Before long were to leave the national trail behind us and up a short climb for our first drink stop overlooking the Goring valley. 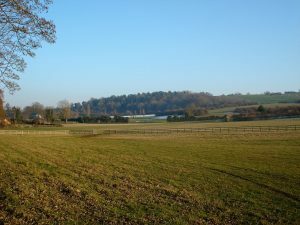 The regulars in the Berkshire group would be familiar of the view here as it always makes for the perfect lunch stop for walks leading out from Pangbourne. We carried on steadily making a gradual incline passing Upper Gatehampton Farm and a field of impeccably behaved cows – we like that! – And on into Great Chalk Wood. Come here in late spring then you would witness the majesty of bluebells in full bloom. It wasn’t too long that I temporarily forgot my bearings and had to pause to establish the precise route. 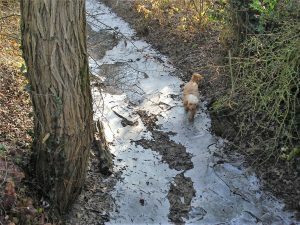 It turned out I had veered slightly off the path in the woods but it was not too long before we were back on the track. The morning loop was heading to its conclusion. 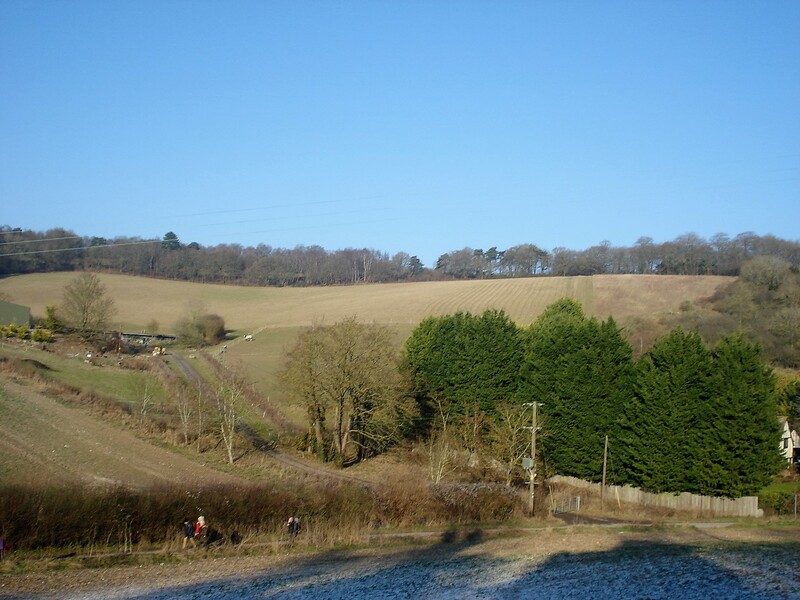 We were rewarded with more nice views as we left the woods and took to the footpath that runs parallel to the Reading Road and back to the start point via a recreation ground. The only snag of having the second walk was that I was slightly weary of the time. We were going to be late, I knew that, but I didn’t want the delay to be unreasonable for anyone waiting for us. We were slightly delayed in starting the walk but we arrived back at 12.15pm, some fifteen minutes later than planned. Not too bad I thought. I didn’t want to delay the afternoon walk so without further ado we said cheerio to a few people and hello to a view others. Numbers were now at 40. I made an amendment by ensuring back marking duties were carried out by someone else. At this point I had received a few requests for a visit to the restroom so progress was slowed by a passing visit to a nearby car part. Not so bad if there are a few of us but naturally with high numbers we had to be patient. The route this afternoon (7 miles) would be mainly in Berkshire, initially starting in the same direction as loop number one and passing the flowers again. However, rather turning left along the Thames Path we carried straight on over the bridge and into Streatley. At the t junction we could see damage to a building as lorry and got “wedged” some time last year causing a significant damage to the property. I had another of my minor navigational missteps as failed to locate the path. I had initially thought it was next to the other side of the Youth Hostel. It had meant that I had got the whole group – the whole forty of us – to cross the road unnecessarily! Ah well. Before long progress was being made as we climbed the steep hill. My original plan was to stop for lunch at the top overlooking the views of the valley but as that was entirely in shade we paused for photos only and headed on to a sunnier spot. In fact, the location we picked was perfect as we parked ourselves onside of a hill overlooking the views of the rolling fields. Although it was not warm, it was not that cold either and for me it was a quite perfect moment to relax, reflect or chat for twenty minutes or so. Before we continued on we said goodbye to a couple who retreated back the way we had come bringing numbers back down to thirty eight. It was hard to gauge which group was better represented but possibly Berkshire edge it in the morning with the Oxon ahead in the afternoon. There wasn’t much in it. 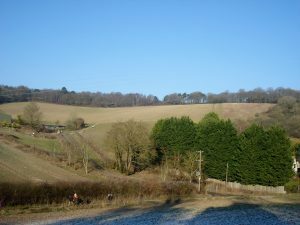 We descended down the hill where we ate our lunches past a small farm, soon picking up a frost heavy footpath and then carefully picking up the path that took us through woods briefly and onto the quiet country lane. This tarmac stretch would last two or three kilometres. One person pointed out the whereabouts of a rather lovely hostelry located not too far away but I was not be deterred from my planned route! Eventually we arrived at the hamlet of Westridge Green, pausing for a drinks stop as soon as we left the road. The next mile or so was rather lovely as we traversed through the Berkshire countryside with everyone seemingly enjoying themselves. This particular bit can be shortened to make for a rather splendid evening walk as I can recall from a couple of years ago. The final leg of today’s adventure was slightly tedious as it was over the road that took us back into Streatley and then Goring. Indeed at one bit we had to take care as the surface was rather slippery. Thankfully there were no accidents. I brought the walk to a conclusion in Streatley providing details on how to return to start point; it was maybe a half mile walk through the villages. As we walked through the villages those that wished then split to head for refreshments via either one of the pubs or cafes. I myself took the opportunity to have second pint while I waited for the train home however it has to be said as the sun begun to set it was getting a bit nippy as we sat outside in the pub garden. Interesting factoid, the afternoon seven mile loop required the use of three 1:25000 OS Maps. This is quite unusual for a relatively short walk. Anyway, here’s to more double (maybe a triple?) loop walks in the future. We reckon we managed to get least fifty people out walking today proving it could be successful format. This entry was posted in Walk Report by Publicity Officer. Bookmark the permalink. GIVE US A TRY! Simply turn up on any walk. You can choose to join after two or three walks. 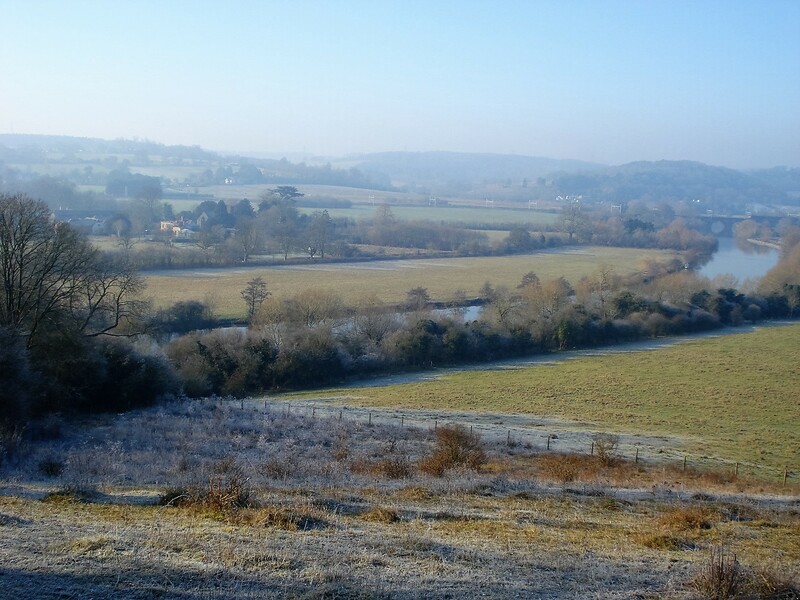 Join us through the main Ramblers' website (please specify group BK50 Berkshire Walkers). 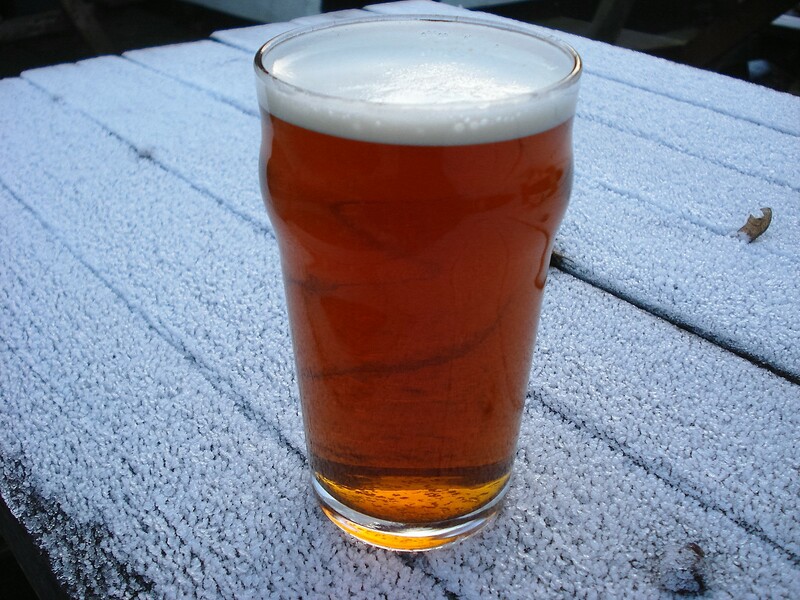 The Ramblers Association is a Registered Charity in England and Wales number: 1093577. Looking for a walking holiday? Book through The Walking Partnership. Remember when you book to quote the name of our group (Berkshire Walkers - Ramblers group BK50), and we will then receive a contribution of £10 per person on UK holidays, £20 per person on short haul holidays, and £30 per person on long haul holidays.